Many thanks to Jacqueline Murekatete and the MCW team for coordinating such a moving commemoration and for including VOR in the program. Co-panelists Zachary Kaufman, Valentina Iribagiza, VOR’s director Taylor Krauss, and Robert Van Lierop, paid tribute to those killed in the genocide, while simultaneously reminding all in attendance of the ongoing challenges survivors must bear, 18 years after the 1994 Genocide Against the Tutsi. 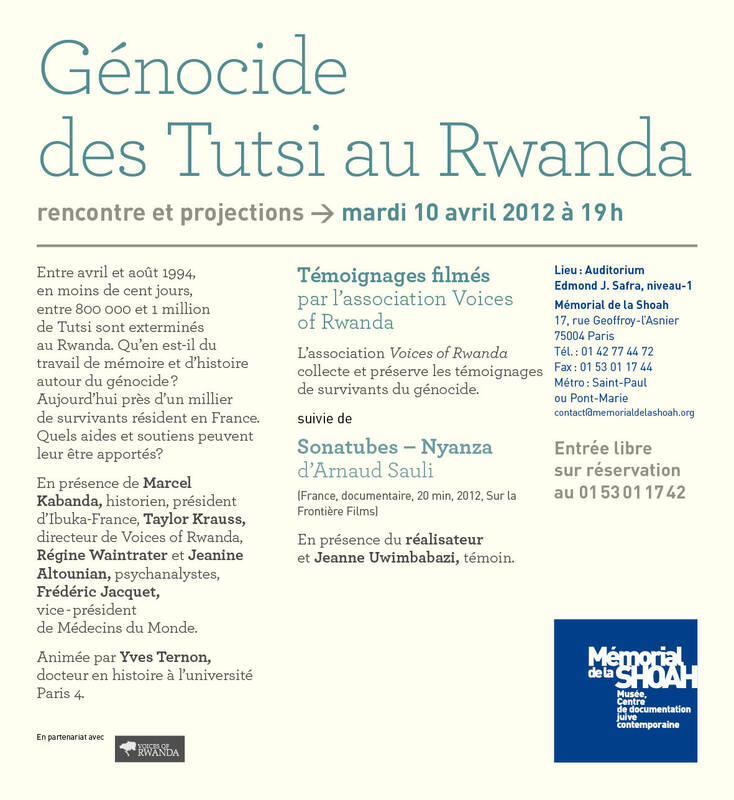 VOR testimonies presented at the 18th Commemoration of the Genocide Against the Tutsi in partnership with Ibuka-France and the Mémorial de la Shoah on April 10th, 19h, in the Edmond J. Safra auditorium (map): 17, rue Geoffroy-l’Asnier 75004 Paris. Discussion moderated by Yves Ternon to follow: Marcel Kabanda, president of Ibuka-France; Régine Waintrater and Janine Altounian, psychoanalysts; Frédéric Jacquet, VP of Médecins du Monde; and Taylor Krauss, director of VOR. Followed by screening of film “Sonatubes – Nyanza” by Arnaud Sauli featuring Jeanne Uwimbabazi’s testimony. VOR hosted by James Madison University’s Hillel to screen testimonies as part of annual Holocaust Remembrance Week. James Madison University, Taylor Hall, Room 306, 7-9pm, Harrisonburg, VA.